“Most children brought up in Brooklyn before the first World War remember Thanksgiving Day there with a peculiar tenderness. It was the day children went around “ragamuffin” or “slamming gates,” wearing costumes topped off by a penny mask. “The street was jammed with masked and costumed children making a deafening din with their penny tin horns. Some kids were too poor to buy a penny mask. They had blackened their faces with burnt cork. Other children with more prosperous parents had store costumes: sleazy Indian suits, cowboy suits and cheesecloth Dutch maiden dresses. A few indifferent ones simply draped a dirty sheet over themselves and called it a costume. 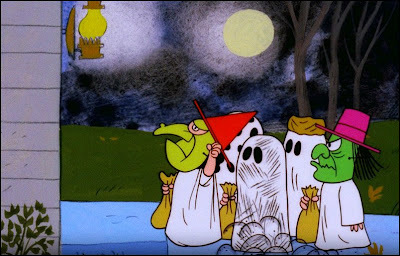 The theory is that spectacles like the Macy’s parade and football games (not to mention shop-keepers fed up with the low-level extortion of snot-nosed neighborhood kids) sent the trick-or-treaters looking for a new holiday to occupy. Thank goodness they found one.